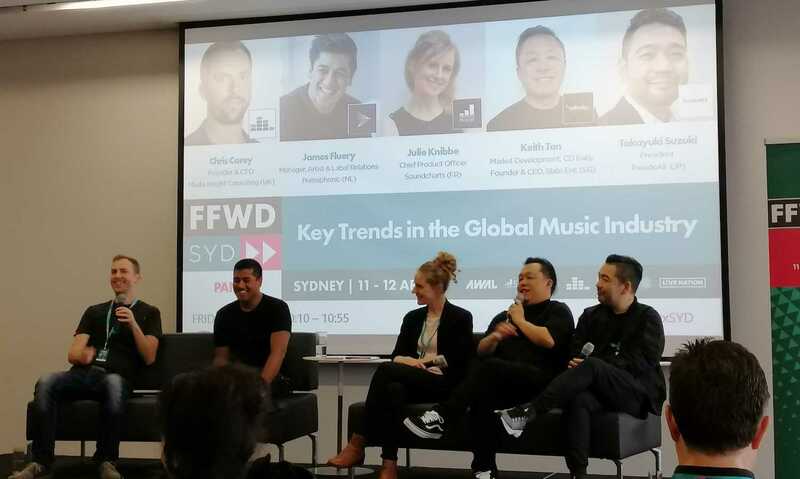 Lead industry thinkers gathered for future-driven music conference FastForward Sydney last week, with day two wrapping up 48 hours of discussion, predictions and networking. One panel discussed some of the key trends in the music industry from a global perspective. Founder & CEO Media Insight Consulting Chris Carey moderated the panel that also featured Primephonic’s James Fluerey, Soundcharts’ Julie Knibbe, CD Baby’s Keith Tran and ParadeAll’s Takayuki Suzuki. These were some of the key trends they identified from their respective countries. The panel discussed the extent to which DSPs have taken over worldwide. However the most popular differs greatly from market to market. When it comes to Northern Europe, 80% of the market uses Spotify, Carey explained. The rise of streaming services has also opened the gateway for local acts to record in their own language. “For so long Dutch rappers were rapping in English,” explained Carey. Most panellists agreed that radio is still seen as a key way for music discovery to take place, especially when it comes to the youth market. Live is also expanding into different formats, with new ways to see and experience music. Some “virtual artists sell more tickets than a real human band,” added Tran. The panel agreed that the rise of vinyl is much more than a fleeting trend, and that the visual element of vinyl is underrated. “You can endorse who you are by showing what’s on your bookshelf,” said Carey. Knibbe pointed out that people still desire ownership in an age where they don’t actually own the streams they can access on DSPs.